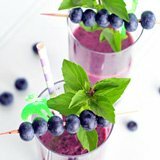 Who would have thought these little round, gorgeous balls of sweetness could make such a delicious smoothie? I love scoffing them down in the summer, either chilled in the fridge or frozen, but had never previously thought of adding them to my blender. But I’m now hooked and you will be too after trying a grape smoothie. Low in cholesterol and fat, grapes have many health benefits. They give a healthy boost to your immune system and cleanse the liver and kidneys. A good source of Vitamin C, Vitamin A and Vitamin K, they are also a rich source of minerals such as copper, iron, manganese and potassium. Red grapes have an extra secret weapon. Their skins contain resveratrol which is thought to prevent certain cancers. It is the same compound seen in red wine responsible for the reduced risk of heart disease. While the white/green varieties contain tannins, especially catechin. The antioxidants are most densely concentrated in the skin and seeds. When buying, look for fruit with a bright color. Green grapes should have a slightly yellow hue, while the darker red, blue/black varieties should have a deep, rich hue. Always buy them fully ripe. They should be plump and free from wrinkles and still attached to their stem. The area at the base of the stem should be the same color as the rest of the grape. Grapes should not be stored at room temperature as they tend to spoil. Wash well in cold water before using and store in the crisper drawer of your refrigerator in an airtight container or plastic bag. They will last for up to 5 days. 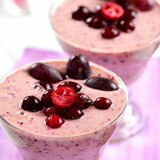 Like all berries, grapes can also be frozen and add a wonderful texture to your smoothies. To freeze, wash and pat dry to remove excess moisture, then arrange in a single layer on a cookie sheet and place in the freezer. Once frozen transfer to a freezer bag and return to the freezer. 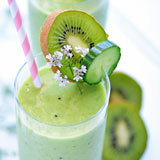 How do you know which variety to use in which smoothie? The sweetness of grapes is determined by their color. Green grapes are medium sweet, red grapes are extra sweet and the blue-black varieties are the least sweet. You should preferably try to find the organic variety, but if you can’t then always wash well before using. Wash under cold running water to remove any pesticide residue. Drain in a colander then pat dry. Use scissors to remove small clusters from the stem. This prevents the stem from drying out and keeps the remaining grapes fresh. 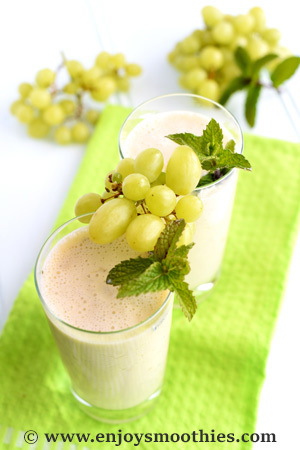 Grapes can be added whole to smoothies or use grape juice. 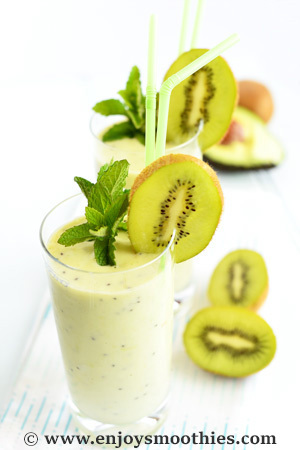 Add the green grapes, kiwi fruit, avocado, vanilla yogurt, almond milk and lime juice to your blender. Blitz on high until everything is beautifully thick and creamy. 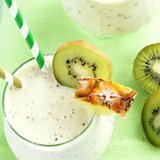 Combine the grapes, frozen, pineapple, yogurt, coconut milk, mint leaves and lime juice into a high-power blender and puree until smooth. Makes 2 cups. Pour into glasses or take with you in a mason jar. Blend together the grapes, banana, almond milk, peanut butter and almond butter until smooth and creamy.